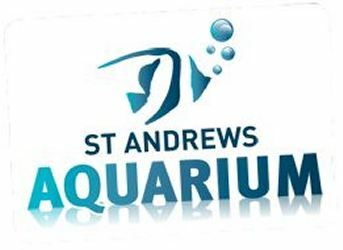 Two toothy American alligators, Barack & Michelle, came to live at St Andrews Aquarium last winter as little baby snappers, but these apex predators don’t stay small for long. 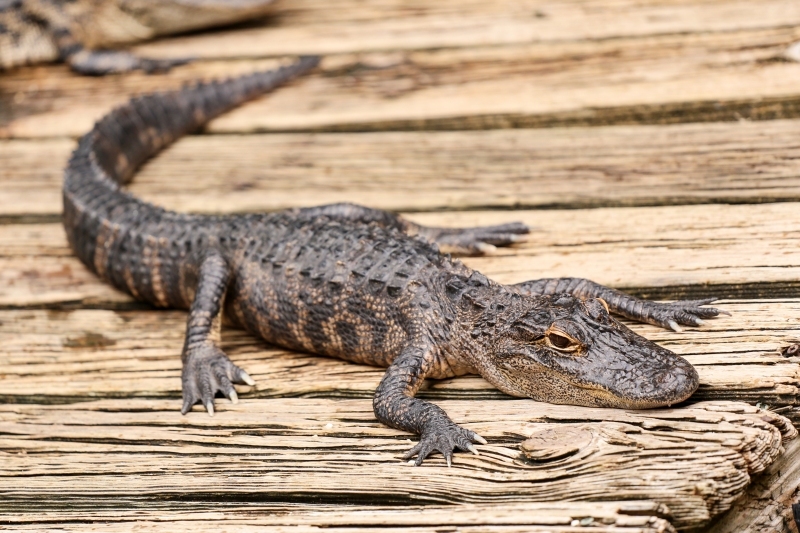 Once an endangered species, the American alligator population has been brought back from the brink of extinction thanks to dedicated global conservation efforts. 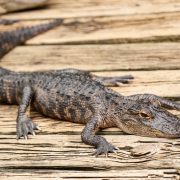 Our alligators require special care and attention, so read on for a snappy insight into the alligator lifestyle as we get the reptilian skinny from one of our pampered alligator mississippiensis. Life is a seafood buffet when you’re a ‘gator; fish, turtles, or any little critters that come too close to the water: I’ll snap my powerful jaws around any morsel I can find, so watch out for those fingers and toes! Have you seen my teeth? Rather magnificent, and my pride and joy; I can chomp my way through up to 3000 of them in a lifetime, all without the intervention of a dental professional. If you think that’s impressive, wait ‘til you hear about my glottis; it’s a nifty valve at the back of my throat that it lets me devour my prey, even when I’m underwater. Never know when you might get peckish, eh? I might thrash around a bit if you DARE compare me to a crocodile, especially once I’ve told you how to tell us apart. My teeth remain tucked away neatly when I close my mouth; and my snout is much more rounded and elegant. I spend a lot of time looking at my reflection in the river, and I have to conclude from my mirror image I am a rather handsome fellow. I like my water fresh, but keep your Evian bottles in the fridge; I’m happy to wallow in any cool, shaded river bed or swamp with low sodium content. Because my body is cold-blooded, I can regulate my temperature to suit, but generally, I like things cosy, and prefer the warm swamps of Florida as my home. Mmmm… catfish gumbo, divine! It takes me up to ten years to reach maturity and I attract a mate with my fearsome roar! If she takes a liking to me, we can have 90 eggs together. I’m a doting parent, and even though up to 80 per cent of my hatchlings can fall foul of Mother Nature, I’ll defend them ferociously from harm. The good news is, once we’re grown there’s no stopping us, and as an apex predator I can expect a good innings; I might live to snuff out 50 candles on my birthday cake before I retire. B is for Black Tip Reef Shark Watch the space…Amazing Amazon coming soon!